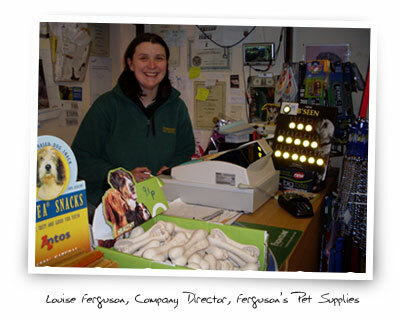 Ferguson’s Pet Supplies is a family run business, based in Tranent, East Lothian. Established in 2004, we pride ourselves on not just supplying pet supplies, but also providing help and advice to anyone who requires it. We hope to extend this to our online customers now too. We have access to order over 20000 product lines! If you are looking for a specific product or need some help choosing – contact us and we will aim to have what you need within a very short time. Every care has been taken to ensure that all product information provided is accurate. Descriptions, measurements, colours, prices and offers are all correct to the best of our knowledge. We are available Monday - Friday 0900 - 1700, on 01875 619789 to deal with questions, queries, problems or requests.